OmniTrax 3.0 Interchangeable Sole System adapts your traction to meet changing weather conditions. Includes two outsoles: SnowTrac winter rubber lug and IceTrac studded rubber lug with carbide studs (32 studs/pair). 100% Waterproof construction includes waterproof, breathable bootie, waterproof leather, webbing, and stitching to keep the foot bone dry. 1200g of 3M Thinsulate insulation for the ultimate warmth during less active adventures like ice fishing and snowmobiling. Protected Stitching strategically placed around the toe and heel for added abrasion resistance. Boa M2 lacing system for quick on-off and custom fit, extra tall silhouette provides protection and support, 11'' height. Material: Leather, Rubber. Versatile - OmniTrax 3.0 Interchangeable Sole System adapts your traction to meet changing weather conditions. Traction - Includes two outsoles: SnowTrac Winter Rubber Lug and IceTrac Studded Rubber Lug with carbide studs (32 studs/pair). Waterproof - 100% waterproof construction includes waterproof/ breathable bootie, waterproof leather, webbing, and stitching to keep the foot bone dry. Insulated - 1200g of 3M Thinsulate insulation for the ultimate warmth during less active adventures like ice fi shing and snowmobiling. Durable - Protected Stitching strategically placed around the toe and heel for added abrasion resistance. Closure System - BOA M2 lacing system for quick on/off and custom fit. Other Bells & Whistles - Extra tall silhouette provides protection and support. 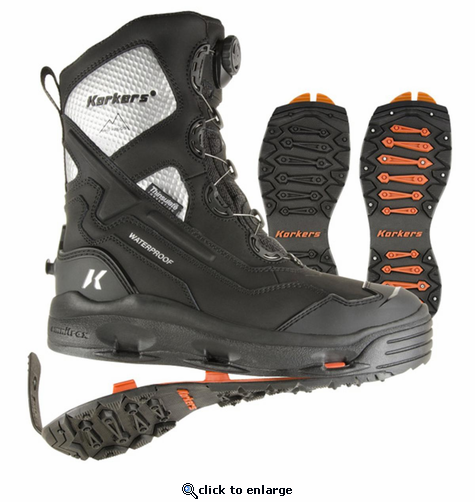 Korkers creates all terrain footwear featuring patented adaptable traction that allows outdoor enthusiasts to optimize their traction performance in varying conditions in and out of water. The Korkers brand was born over 50 years ago on the rugged and treacherous riverbanks of the Rogue River near Grants Pass, Oregon. Made by hand, using scrap rubber, nylon cord, and carbide spikes, Korkers "River Cleats" were created in the basement of Korkers founder, Sherman Smith. Guide Wading Boot The functional yet versatile design of the cleat system quickly grew as a favorite among fisherman who often found themselves slipping and/or falling on slippery river rock, and eventually spread to provide traction safety to a number of industrial applications such as roofing and outdoor work on snow/ice. 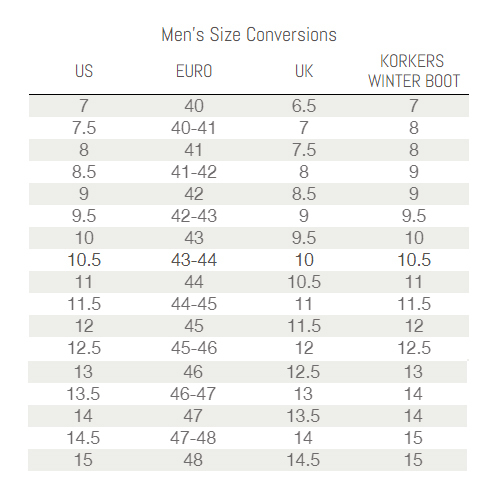 Over the years Korkers hasn't abandoned its independent thinking. The Company continues to be bold and innovative, having the courage to take risks in order to meet the needs of those who identify with the intensity of mountain adventure where extreme conditions can be challenging and unforgiving. Their gear must perform double duty as conditions change rapidly and performance optimization puts every piece of gear to the test. Some people gear up, we prefer "gearing down". That's where Korkers thrives.